Any idea when Apple Pay is due to launch here in New Zealand? Has BNZ been in talks with Apple to provide the service? This would be great for BNZ to get into. I’m not sure on a release date, but when it gets here, we will be looking at it. Do you know if Apple has even discussed it with BNZ? that’s probably something you can’t tell us anyway. When Apple does come, I just hope BNZ partners with them. In Australia Apple and the banks are not playing ball, something about Apple wants to much of the cut per transaction. That’s why its only American Express in Aus at the moment. I have a BNZ debit visa, I just hope I can get use it with Apple Pay. @snuew & @Thomas we haven’t had any formal discussions with them as yet and they are yet to give us clear timing on coming to NZ, the agenda is driven by Apple as they roll this out market by market. But as @Eric mentions, we know that demand will be high so we are already lining up the changes we need to make to be ready when they signal NZ as a destination for Apple Pay - dying to get it myself ! Seeing as ANZ has been announced as an Apple Pay partner in NZ, are you following up with this commitment, or are you following NAB’s instructions and not talking to Apple? I’d love to use Apple Pay, I may have to apply for an ANZ card, so I can use it! APPLE PAY is already here in NZ with ANZ. When will BNZ be getting it? I have another account with ANZ that I didn’t really use but now transfer money to it JUST TO USE APPLE PAY! It’s awesome. I’m actually considering moving back to ANZ purely for this. It seems BNZ are more interested in getting mobile NFC payments on the android platform than on the iPhone. I have to agree, I still maintain an ANZ credit card so I can now use it , however as a branding exercise I would love to see my home bank partnering with them. Early adoption is important as well as supporting Android AND Apple. We know there is a big demand for mobile payments, and we are working on convenient, secure, and new ways for customers to make payments. There are some developments in the pipeline, but unfortunately I can’t share at this stage. Hey Eric, excellent business response that seems to indicate BNZ have no intention of supporting Apple Pay, which is fine. When a new payment technology comes along, we just want a statement of response from our bank for us (as customers) to weigh options according to what’s important to us. As National Australia Bank (the owners of BNZ) have indicated they will not support it in its current form this seems a prudent policy decision. BNZ, just give us a simple answer. All we want to know is are you in talks with Apple regarding Apple Pay. I know this is not the answer you want, but unfortunately I’m not in a position where I can divulge details or information at the moment. Sorry. We will have an announcement coming soon around Mobile Payments, which we are pretty excited about. How soon is soon?? A few weeks ? A few months? A bit slow for me unfortunately. Have started the process to move to ANZ. I’d actually be very interested to see if the current (limited Android handset only) mobile payment system has had anywhere near the demand as Apple Pay has for you. I suspect it’s weighted very heavily to the Apple side. As for the “Apple wants too much” rhetoric we’re seeing in Australia, I’d have thought it a very small price to pay for a mobile payment mechanism with actual security for the customers - something that isn’t provided in NZ with existing solutions. And it’s not like this has been an issue for the many hundreds of other banks which already support Apple Pay. So basically for anyone that is interested BNZ will NOT support Apple Pay now or in the foreseeable future. They are working on there own mobile payment system which will work on the Android platform. If it’s not Apple Pay on iOS then there is no way to use the NFC chip in iPhones or iWatch for Pay pass and Pay wave. BNZ (via NAB) has basically said sorry iPhone users. We won’t support mobile payments for you. Get an android phone. Bye bye BNZ . Like others, I’m moving my accounts permanently to ANZ. Interestingly having applied for anANZcredit card out of frustration at the lack of info re Apple Pay and the actions of BNZ’s parent bank in Aussie they (ANZ) have advised the wait is longer due to a very high number of applications. They must be loving being the only NZ bank to have Apple Pay. I also want it and will wait only so long. If others have it the solution is simple. Well there goes a big stuff you from BNZ for all Apple iPhone BNZ customers. We will only use Android Pay because it’s open source and we don’t have to pay as much for it than Apple Pay. 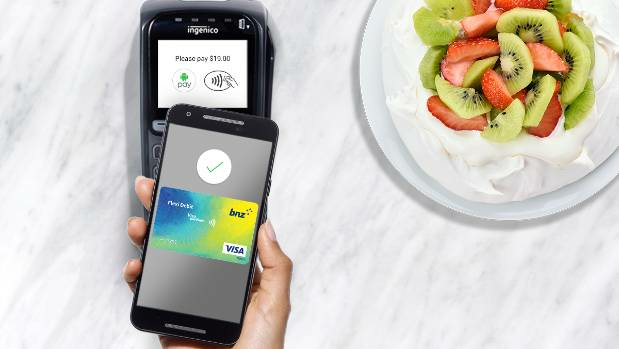 Google's Android Pay service has arrived in New Zealand, but only for BNZ customers. I thought this might be the case, that’s why I’ve already opened an ANZ saving account and got an ANZ credit card. let me say, having used Apple Pay for only a few days so far, it’s amazingly quick and reliable. Far safer than the android & Flexi system the BNZ have chosen to go with. I Have to say I’m very disappointed, bnz could have hit a home run by offering both options for their customers.